Hi! My name is Tony Leaster and I have a lot of different barrels for various usage (I own a big house so they’re very useful for different things. 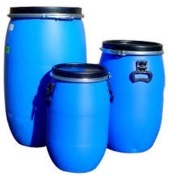 But probably just like you, I had always problem finding quality plastic barrels in stores and as well online, especially for reasonable cost. That’s why I have decided to create this website to help all of you who are looking for best one that your money can buy. Here I will offer some useful reviews and comparisons and also tips to get the barrel that will suits you best. I really hope you find my blog useful. for any additional questions you can contact me via e-mail form on “contact me” page.